"My passion is to help successful people convert their lifelong dreams into a Sedona reality." Lee is a founding member of Sedona Luxury Real Estate Professionals (SLREP), a select group of Sedona REALTOR® who are active in the luxury real estate market and promote luxury Sedona properties both in the United States and abroad. 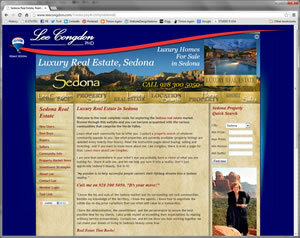 "I know the ins and outs of the Sedona market and its surrounding red rock communities. Besides my knowledge of the territory, I know the agents; I know how to negotiate the subtle day-to-day price variations that can often add value to a transaction. I have the determination, the commitment, and the perseverance to secure the best possible deal for my clients. I also pride myself at exceeding their expectations by making ordinary service extraordinary. Contact me, and let me show you how working together we can make your dream of living in Sedona's beauty come true." Sedona and the Verde Valley have been serviced by more than 900 real estate agents. During her 13 year career, Lee has annually ranked among the very top 20 producers, a tribute to her tenacity and dedication in satisfying the needs of both Buyers and Sellers. "The highest compliment I can receive is a referral from a client who is also a friend!" You, too, can be one of my satisfied clients (and friends). All of the above individuals began by first becoming a VIP Member and allowing me to do for them what I would be only too glad to do for you – turn your Sedona dream into a reality!